DENVER (AP) -The playoffs were starting to slip away from the Colorado Avalanche, who have embraced the final two weeks of the regular season as a prelude to the postseason. The Avalanche snapped a four-game losing streak with a crucial 2-0 win over Calgary on Monday night behind Jordan Leopold's first goal in 2 1/2 months and Jose Theodore's third shutout of the season. The skid had sent the Avs from first place in the Northwest Division to clinging onto the eighth and final playoff spot in the Western Conference. With the win, they moved into a tie for seventh with Vancouver, three points ahead of Edmonton and four ahead of Nashville. "We had to start somewhere," Leopold said. "We played a pretty solid game, we gave up a few opportunities but Jose was there to close the door." The Avs also moved within two points of Calgary, which trails Minnesota by one point for the division lead and failed to move into a tie with the Wild. "These guys are in front of us, and we want to keep climbing," said Ryan Smyth, who recorded his 600th career point. "We know that the teams behind us are pushing, and it's important we keep our position. The only way we do that is taking care of our own destiny and taking matter into our own hands." The Avs were hoping for a boost from the home crowd at the Pepsi Center, where they're 24-12-2, and they got it, improving to 10-3-0 against divisional opponents on home ice. "It's tight hockey right now; it's playoff hockey, four-point games that are huge for us," Leopold said. Theodore had 23 saves, including one on the power play in the final minute. "When they did have chances, I was seeing the puck well, I wasn't screened, so every time I can challenge I'm at my best," Theodore said. "In this league, we have to play really well defensively. These are playoff-type games. You know there's not going to be too many goals on either side. When they get chances you want to make sure you give your team a chance to win," Theodore added. Colorado, which plays three of its final five games at home, where they've won six of their past seven, endured a scoreless first period for the fifth straight game, then went ahead 1-0 on Leopold's fourth goal of the season, on the power play at 6:36. Leopold scored from the slot after the puck had been passed six times, the last by Peter Forsberg, who returned to action after sitting out a game with a pulled groin and skated on the third line. It was Leopold's first goal since Jan. 5 against the New York Islanders, a span of 28 games. Wojtek Wolski had the pass to Forsberg, and his assist gave him 100 career points. 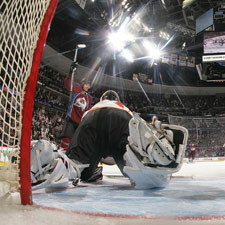 With 7:41 left in the third period, the Avs scored an insurance goal when Milan Hejduk scored on an assist by Paul Stastny and Smyth. "I thought it was a businesslike game," Avs coach Joel Quenneville said. "Our defensive game was rock solid. Jose was excellent as well, several key stops at critical times. Our power play contributed with a timely goal. Across the board we paid attention to detail and were efficient in checking." 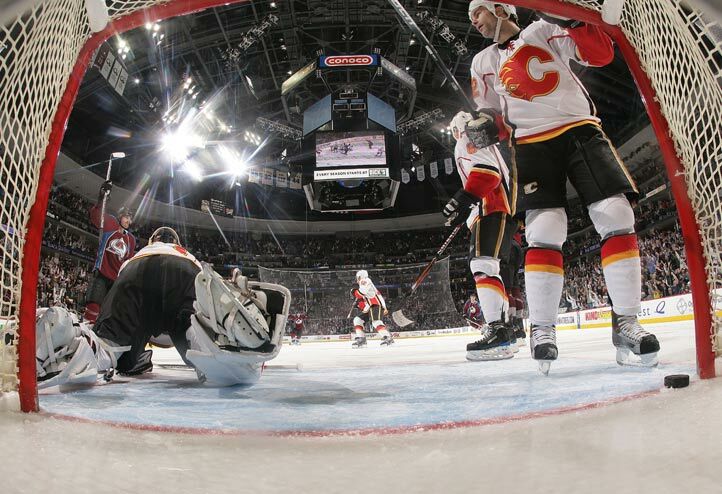 Calgary goaltender Miikka Kiprusoff stopped 22 of 24 shots, but he was replaced by Curtis Joseph after allowing Hejduk's 24th goal of the season. The Flames pulled their goalie with a minute remaining, and had a power play when Kurt Sauer was whistled for hooking. But they were unable to score. Flames coach Mike Keenan was at a loss as to why his team didn't show more intensity with a chance to move into first place. "They outhit us and outplayed us," Keenan said. "They were certainly desperate and they were more desperate. I expected us to play more desperate because of the opportunity for us to move into first place. We knew that Edmonton was winning by a lopsided margin and the players didn't play harder and more desperate considering the opportunity." This was the 26th career shutout for Theodore (24-21-2), whose goals-against average of just less than 2.20 since January is third-best in the NHL. Notes: The Avalanche won five of the eight games between the teams this season but only won 10-9 on points. ... Avs captain Joe Sakic's game-worn gloves from Saturday night's game in Edmonton, where he became the 11th player in league history to record 1,000 career assists, are headed to the Hall of Fame. ... The Flames were 0-for-5 on the power play with just four shots.